My dad is a wonderful gardener. Every spring, for as long as I can remember, he’s tenderly cared for all kinds of vegetables including lettuce, squash, zucchini, and tomatoes. All of his veggies are great, but nothing can beat my dad’s tomatoes. They’re the best tomatoes you’ll ever eat, hands down. This year, my dad me asked if I’d like to grow some tomatoes of my own. I wasn’t sure at first… Did my yard have a spot with enough sun? Would I accidently kill them or worse yet, would they become breakfast for the millions of bunnies in our town? Finally, I agreed to try. By the end of March, Dad had already started several plants from seed. He gave me a large pot and two of his tiny little plants. He recommended that I also get a trellis (my kind neighbor gave me one he didn’t need anymore! ), special tomato fertilizer, and a roll of stretchy plant tie, and then I’d be ready to go! I was instantly protective of my little plants. For the first couple weeks, it was still too chilly to plant them in their pot outside, so I set them in the sun each day and then brought them back inside each night to keep them warm. After a couple more weeks, they were ready to be transplanted to my pot. I surveyed my yard to find the perfect spot, and replanted them. After a few days, I decided that spot wasn’t as perfect as I originally thought! As spring progressed and other plants in our yard started filling in, they began to block the sunlight getting to my tomatoes, so I moved them to the other side of the yard. 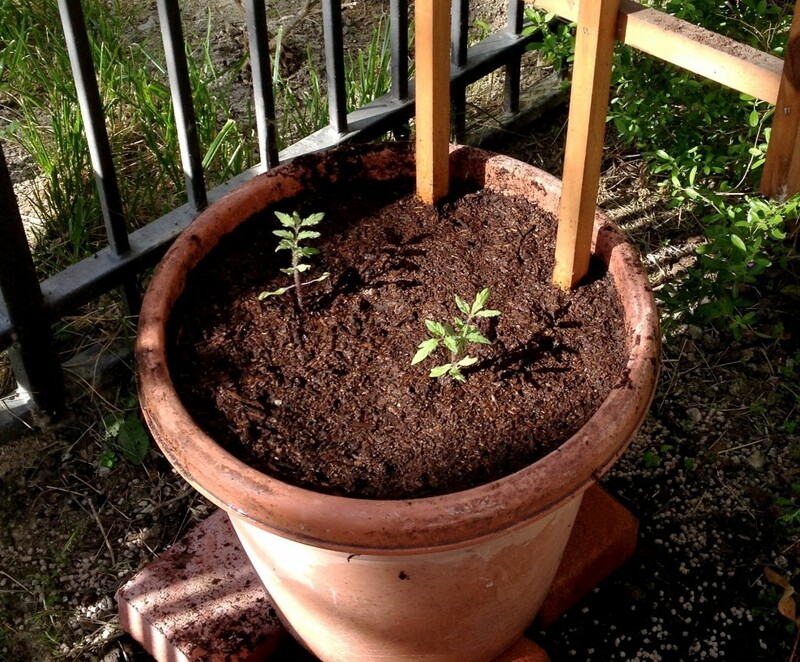 Here they are in their second spot – growing well! After a few more weeks, our side yard finally became sunny again, so I moved them there behind our fence to make sure they would be safe from bunnies. Here they are in their final resting place. With regular watering and fertilizing, they grew so fast that I could see daily growth! By early May, they had also developed flowers, which my dad said would turn into tomatoes! I was very excited! Spring was a little chilly this year, however, and tomatoes like the heat, so while the plants looked great and were growing well, it felt like a LONG time before they finally grew any tomatoes. One tomato finally started around the end of May. Unfortunately, I didn’t get a pic of it, but here’s a pic of another one. It’s so cute! In the beginning of July, my first tomato turned red! I read online that tomatoes are ripe once they turn red and feel firm, but not hard. This one still needed a few more days to soften a bit. 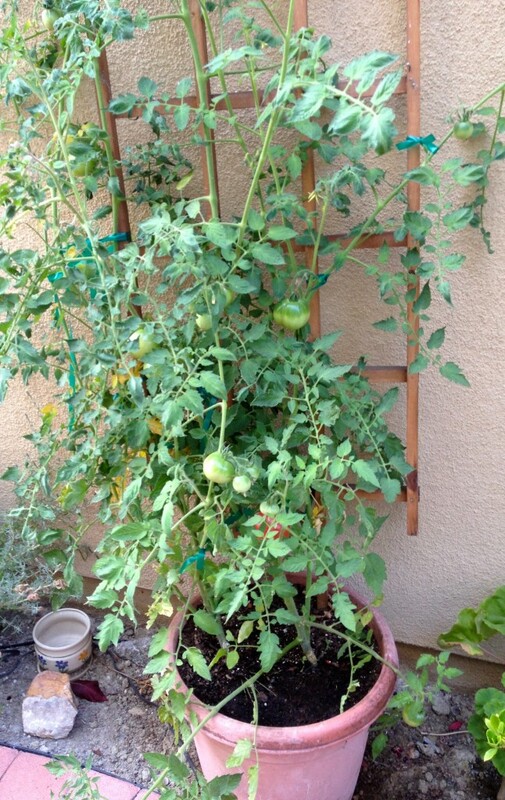 My baby plants are now huge and thriving and full of tomatoes growing larger every day. They’re also now over a foot taller than their trellis! 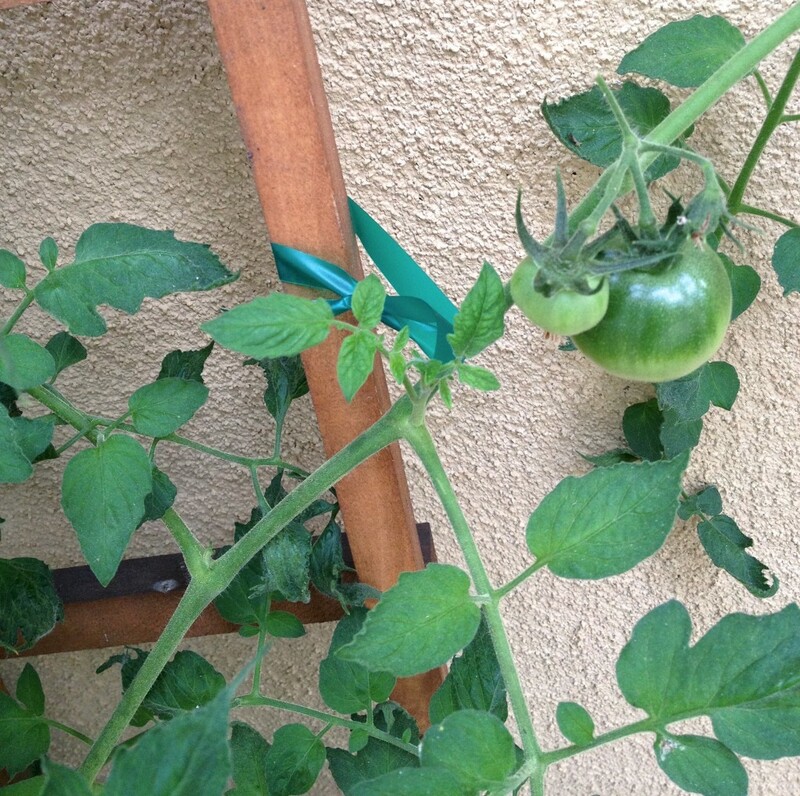 I’m excited to harvest them and be able to eat tomatoes from my own garden for the first time! 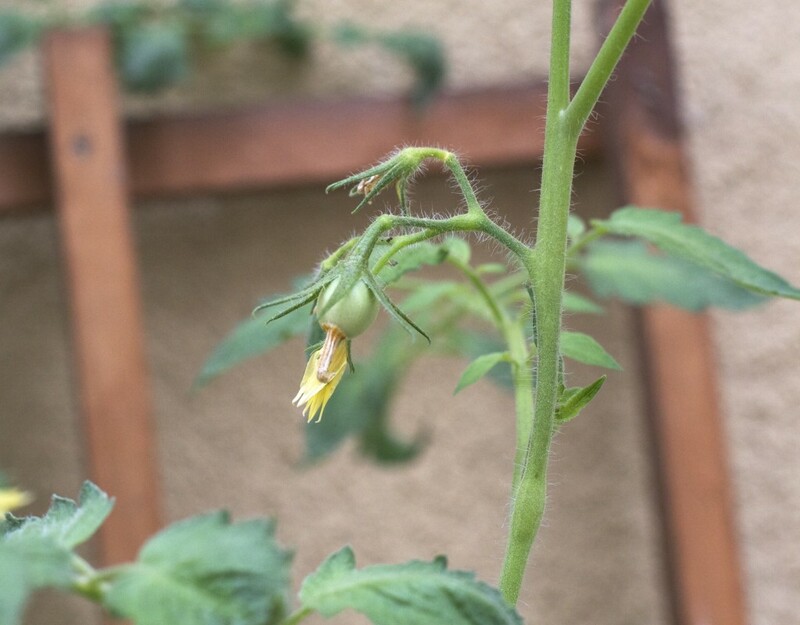 1) Tomato seeds or small plants – you want to make sure you’ll end up with at least 2 plants to plant together for cross-pollination. 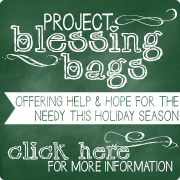 2) A large pot (at least 1 ½ ft. wide for 2 plants), a large raised bed, or a large spot in your garden for planting. 3) Potting or garden soil for vegetables. 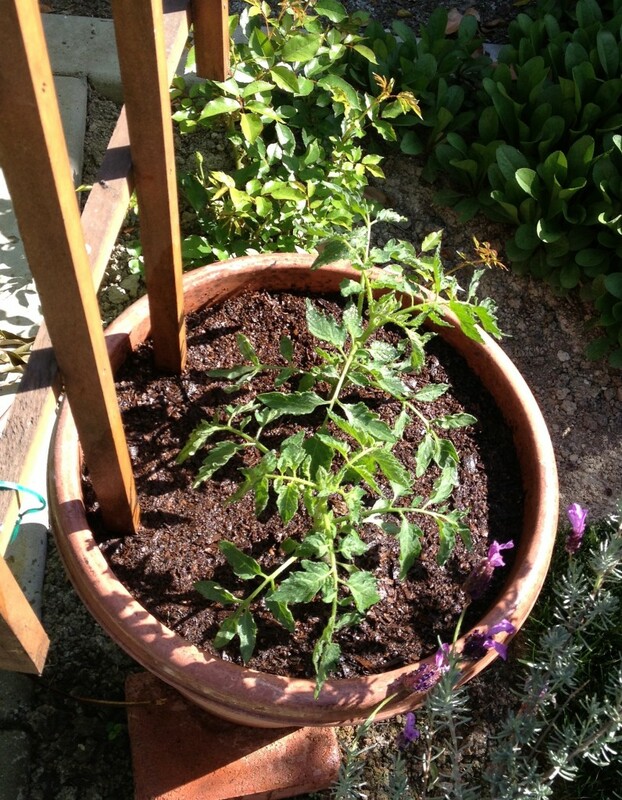 4) Tomato fertilizer – Miracle Grow for tomatoes worked great for me, but any kind you prefer is fine. 5) Trellises – 1 trellis per 2 or 3 plants, depending on the size of your trellis. 6) Stretchy green plant tie. 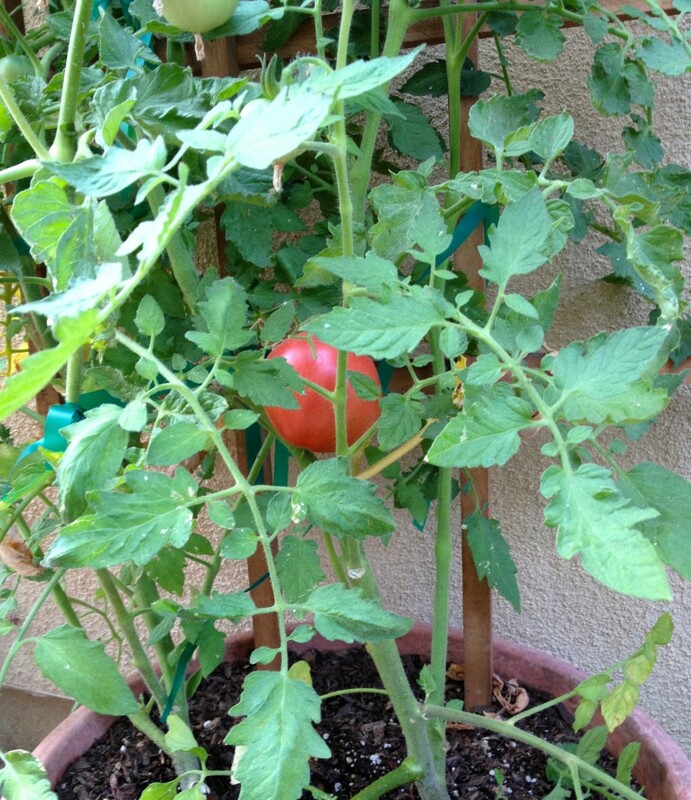 7) A spot in your yard or garden, which gets at least 5 hours of full sun or more – tomatoes love heat and lots of sun. If starting from seed, plant your seeds in late February or early March. My dad started them in soil in medium sized Styrofoam drinking cups with a small hole in the bottom for drainage – one plant per cup. If you prefer not to use Styrofoam, plastic cups or anything similar that can stand up to soil and water would be fine. If you plan to buy baby plants, you can buy them anytime in the spring, but sometime in late March to mid April is probably best, depending on your weather. Transplant baby plants to your garden or pots around mid April, or once the weather is consistently in the high 60’s to low 70’s during the day. Plant your plants in front of their trellises – about 6 to 8 inches from the trellis is fine. Once your plants are about 1 ½ ft. high and/or have developed some flowers, begin gently tying stems to the trellis. The goal is not to tie them up so they’re touching the trellis, but to tie them so the trellis is helping support their weight. Here are a couple of examples of stems tied to their trellis. As the plants grow, continue tying up any stems that seem to need extra support. 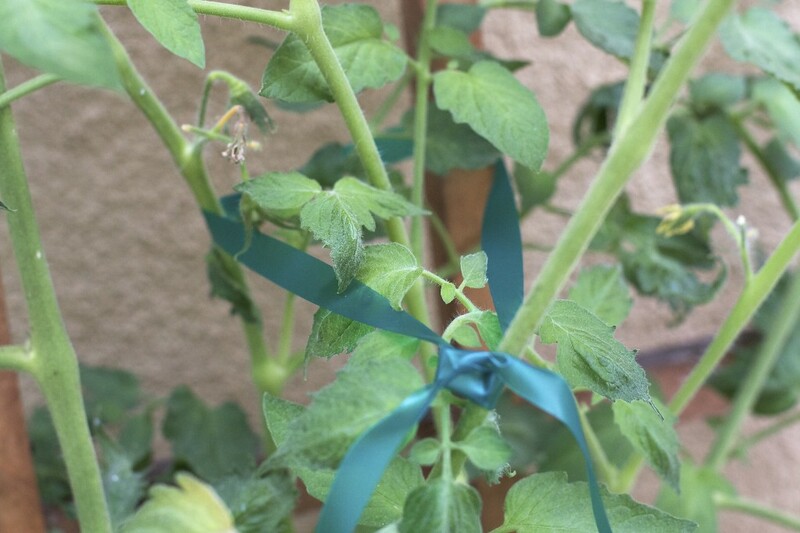 Also, keep in mind that tomato stems can be very delicate and can break off easily – especially once they’re supporting the weight of tomatoes – so work with them carefully. Water your plants every other day until the weather is consistently in the mid 70’s each day. After that, water them every day, and if possible, at about the same time of day. Give them just enough water so that the soil stays moist each day. 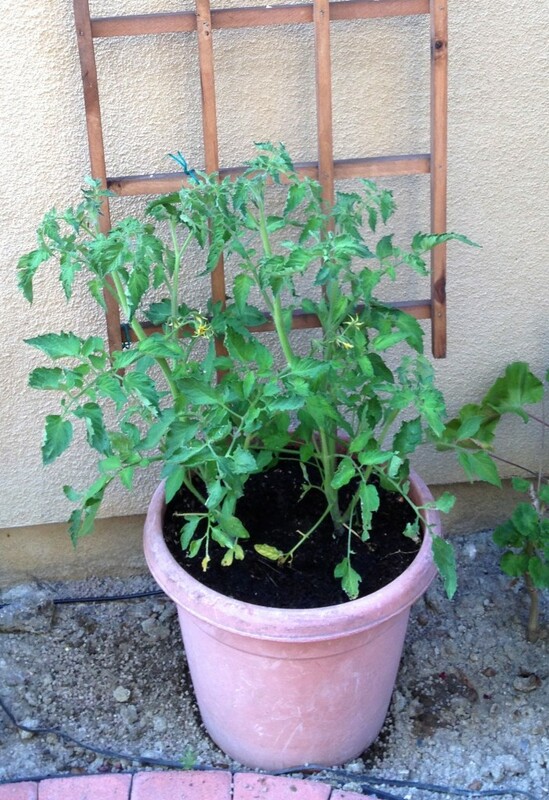 Once tomatoes form, be careful not to get any water on them or they might split while growing. Fertilize your plants about every 2 weeks. If any stems/leaves turn completely yellow and shriveled, pinch them off at the base of the yellow stem. You shouldn’t get too many of these, but they may occur near the lower part of more mature plants. Regularly check stems and the underside of leaves for bugs. Pull or wipe them off if you find any. If desired, protect your plants from snails by sprinkling snail repellant around the base of your pots or around your plants in the garden (try to keep it as far from your plants as possible, while still close enough to make a difference). Harvest tomatoes once they have turned red and feel firm, but no longer feel hard to the touch. Feel them very gently, so as not to accidentally pick them before they’re ready! Do you love to garden or are you just a beginning gardener like I am? I’d love to hear if you have any questions or extra tomato growing tips! Or, do you have another favorite vegetable or herb you love to grow? My dad also is a tomato farmer! They are soooo good. I can’t even eat store-bought tomatoes anymore. I’m thinking about doing a topsy-turvy. I know! Store-bought can’t compare at all! I still buy them when I can’t get them from the garden, though… But, then I look forward to fresh grown!